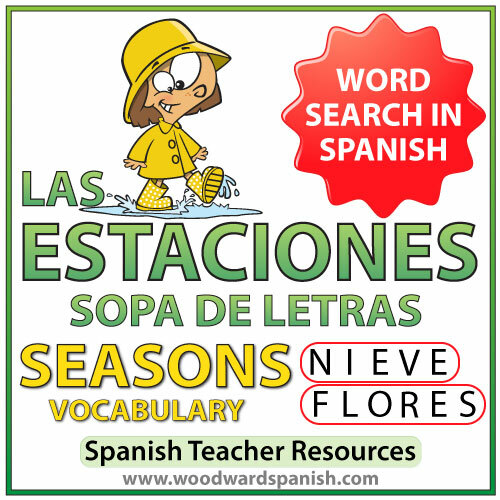 Word Search with Vocabulary about the Seasons in Spanish. Sopa de Letras con vocabulario acerca de las estaciones. This activity contains the following 20 words: primavera, alergia, flores, narciso, regadera, verano, calor, playa, quitasol, vacaciones, otoño, cosecha, hojas, rastrillo, viento, invierno, bufanda, estufa, lluvia, nieve. One worksheet is without clues. There are lines (spaces) where students have to write the Spanish vocabulary about the Seasons that they have found. This worksheet is good for students that have already seen this topic or are normally fast finishers. This Word Search is completely in Spanish without any English on the worksheet. 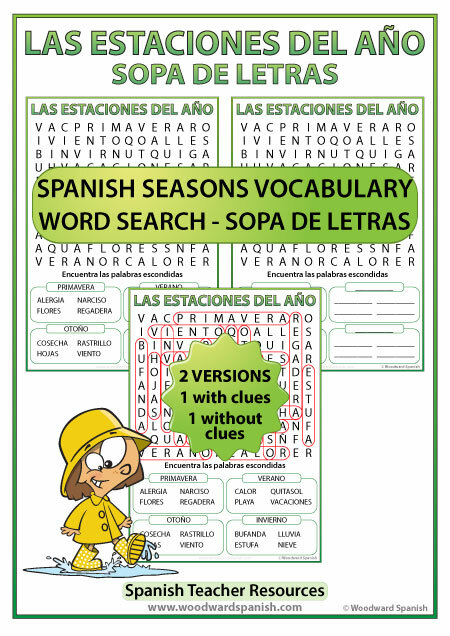 It is ideal for Spanish 1 (word search with clues) or Spanish 2 (word search without clues). Sopa de Letras con vocabulario acerca de las estaciones del año. Contiene 20 palabras:primavera, alergia, flores, narciso, regadera, verano, calor, playa, quitasol, vacaciones, otoño, cosecha, hojas, rastrillo, viento, invierno, bufanda, estufa, lluvia, nieve.